Special:EditWatchlist displays last modified timestamps inline, which can often be very different from the last edited timestamp we show at the top of the page (in stable). 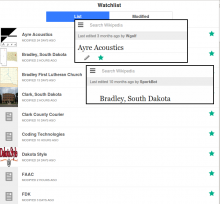 We should show the last edited timestamp on Special:EditWatchlist for consistency. Watchlist entries on mobile do not show "modified" and the modified date. Watchlist entries on mobile show "last edited" and the last edit date as we do on the page last edit bar (see screenshot). The last modified time given under each article on the mobile version of watchlist are often (always) wrong. Not even close. They're not even wrong by the same amount. For example, it will show "modified 2 hours ago" when the actual edit was 10 months earlier. I've attached an screenshot of my watchlist with a couple article pages. 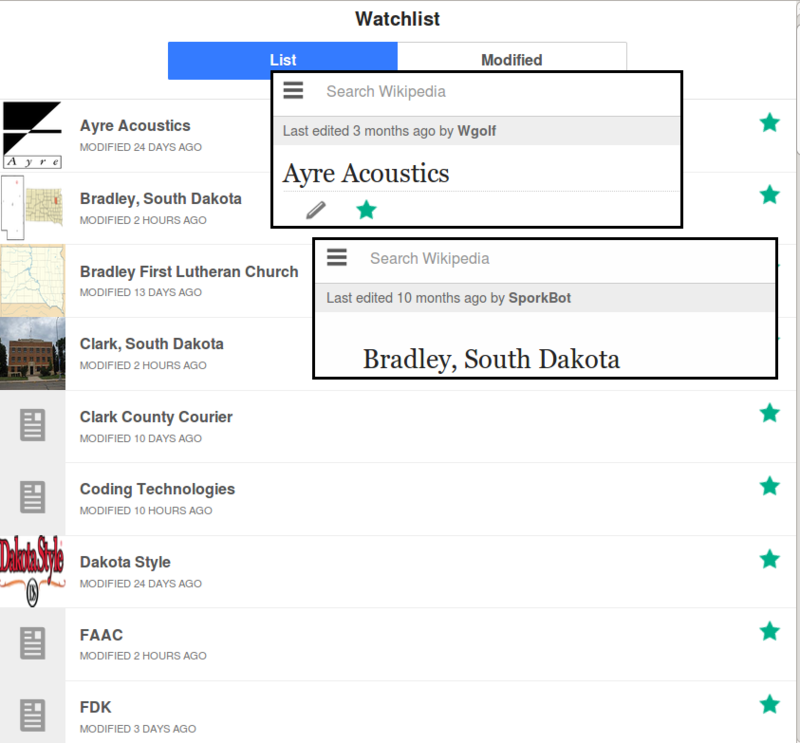 While I've only included the first two articles, every last-modified time given in the watchlist does not match the one given on the page. Bp0 raised the priority of this task from to Needs Triage. Bp0 added a subscriber: Bp0. bmansurov moved this task from To Do to Doing on the Mobile-Web-Sprint-48-Voyage-of-the-Damned board. Aside from editing this includes permission changes, creation or deletion of linked pages, and alteration of contained templates. The screenshots also confirm this - the last edited timestamp is earlier than the last modified timestamp in both cases. If we decide to change this behavior, I'd like to know to what. Pinging Design and @JKatzWMF to see if they have anything to say. It appears that you are right, as a null edit will change the time on the watchlist but not on the page. What is the value of that? @kaldari, what do you think about ^? @KHammerstein: Arguably, this is UX debt. What do you think about this? phuedx moved this task from Old Unorganized Resolved Tasks to To Triage on the Readers-Web-Backlog board. phuedx added a project: Mobile-Web-Sprint-49-Wayne's-World. phuedx reassigned this task from bmansurov to • KHammerstein. @phuedx This looks to me like a bug on an existing feature. I think we should fix it but I'll leave it up to how you guys prioritize bugs. UX debt would address new features or iterations on existing features, not technical bugs. @bmansurov Oh I see what you're saying. Lets make them consistent. Should we go with last edited or last modified on both? @KHammerstein, I think we should go with 'last edited'. I don't think many people care about the time when a permission changes for example. KLans_WMF moved this task from Old Unorganized Resolved Tasks to 2016-17 Q2 on the Readers-Web-Backlog board. Hmm, I think, that a protection of a page should be visible in the Watchlist, too (btw. it's visible in the desktop watchlist). It's an important information for the editing community, just as an edit to a page. Another kindof absurd example: if one is watching the page [[Chinese calendar]] the last modified time in the mobile watchlist is whenever someone last clicked the "refresh" link in the little box on the left, or the "purge" link in the Structure -> Day, hour, and week section. That doesn't really seem useful in any way. Let's make it consistent with the date shown in the page, thanks for the input to everyone. Moving to next sprint. Thanks for the report @Bp0. Jhernandez edited projects, added Reading-Web-Sprint-54-28-Days-Later, MobileFrontend; removed Readers-Web-Backlog. Jhernandez added subscribers: • Jaredzimmerman-WMF, ori, • Qgil and 5 others. Bp0 added a subscriber: RicoRico.